i had all my ingredients set to make more macarons, but i lacked the enthusiasm to sift, sift, sift. 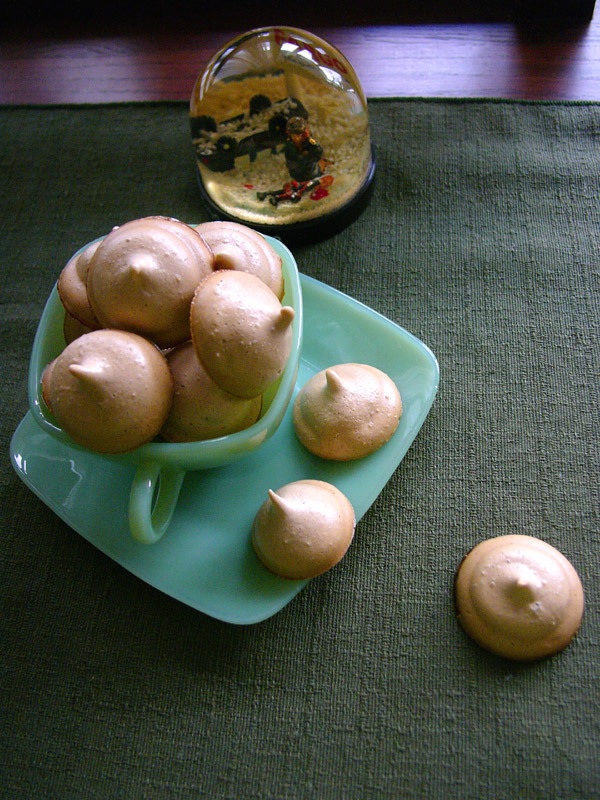 so, a little change of plans, a little time made, and these little coffee meringue kisses were whipped up. coffee for flavour, and also because meringues tend to brown on me, no matter my diligence (or usually, lack thereof). no less sweet--literally and figuratively--than a macaron, yet quite a bit less fussy. preheat oven to 175˚F. in a large mixing bowl, beat the egg whites and vanilla extract until frothy. add cream of tartar, and continue beating at medium speed until soft peaks form. Increase beater speed to high, and gradually beat in sugar. add coffee powder. Continue beating until stiff peaks form and mixture is glossy. pipe out meringues into desired shape, or plop even teaspoonfuls onto a parchment/silicone mat lined baking sheet, leaving about an inch between meringues. bake until dry to the touch; i tend to bake them overnight, but you can bake them for 3 hours, then just leave them in the oven with the door closed (or is it held slightly ajar with a wooden spoon? i think that works in drier climates) for several more hours. transfer to a wire rack to cool completely. store in an airtight container. oh, lardy me. tried making cornish pasties, which was a complete failure, and also left me with una caja de manteca, a big box of lard, which took ages and miles to find. no wrinkling of noses! you'll look like the pig from whence it came. also, it is better for you than margarine, and creates the kind of texture you want in your flaky, tender pastry--namely, flakiness and tenderness. much like those annoying mcdoctors in that...that show. i digress. lard love you, it is what you need to make a very good shortcrust pastry. so says the man. follow his recipe, because it's only a splash away from the one i used. because i lack that pie thingy of which he writes, this is a very freeform apple pie so grandly renamed "crostata," because it sounds better than "freeform" (which i believe is the name of a training bra). and, to somewhat dispel the idea that all baking is all measure twice, calibrate often, here is the rather haphazard recipe. 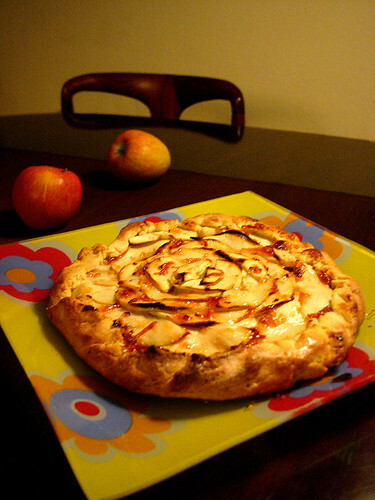 you don't need to use apples, just whatever fruit you have on hand--i did indeed use two granny smiths and one roma peeled and sliced, but anything from berries to stone fruit will work. once you've got your dough done, let it rest in the refrigerator for about half an hour; prepare your fruit whilst waiting. take the rested pastry from the fridge, let it warm up a bit, then roll out evenly to the size of a large dinner plate. as an added sweet touch, a judicious grating of almond paste was laid over that--just enough to add that cyanide-y taste of marzipan, and just enough sweetness to balance out the tart apples spread out on top. to glaze or not glaze is your choice (i did, with some blood orange marmalade found in the fridge. more bitterness for my bitter heart. sweetness for me sweet tooth.) do i need to tell you to make sure you don't spread out the filling to edges, but instead leave about a one-inch border of crust? no. but i did. fold that border over in the most attractive way you can. brush the edges with a little beaten egg, sprinkle on a bit more sugar, pop in the oven at 200˚C or 400˚F, until the edges are golden brown, about 40 minutes. very good no matter what, but best if served warm. i'm chilling out in mexico. 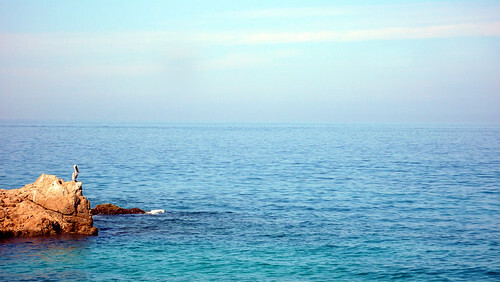 i'll be with you here and on my la blog shortly! this recipe is a cross between a traditional tinaktak recipe and peter dueñas's rather excellent version at sam choy's on island. this chamoru recipe usually uses ground beef, but mine uses ground turkey for lower fat content; if you seek to make it leaner, use light coconut milk if you can find it. the vegetables are normally cooked with the meat in stew fashion, but i prefer my veggies to be a little more al dente and vibrant, so i've cooked the long beans separately with a very quick steam in the microwave--just lay the veggies in a shallow dish, add a couple tablespoonfuls of water, cover the lot in plastic wrap, and zap for 2 minutes. stop the cooking with a quick ice bath, and you have a nice lightly snappy, bright bean. 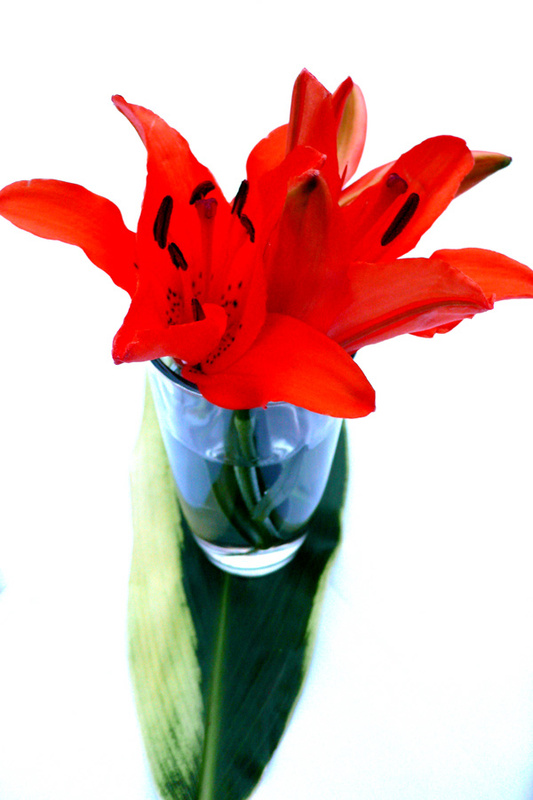 soak achiote seeds in one cup of water for at least 30 minutes. strain the seeds, retain the water for later. heat the vegetable oil in a deep pan over medium high heat. sautée garlic and onion until the onions are translucent, but not browned. add the ground meat, continue to sautée until the meat is browned. add achiote/annatto water. 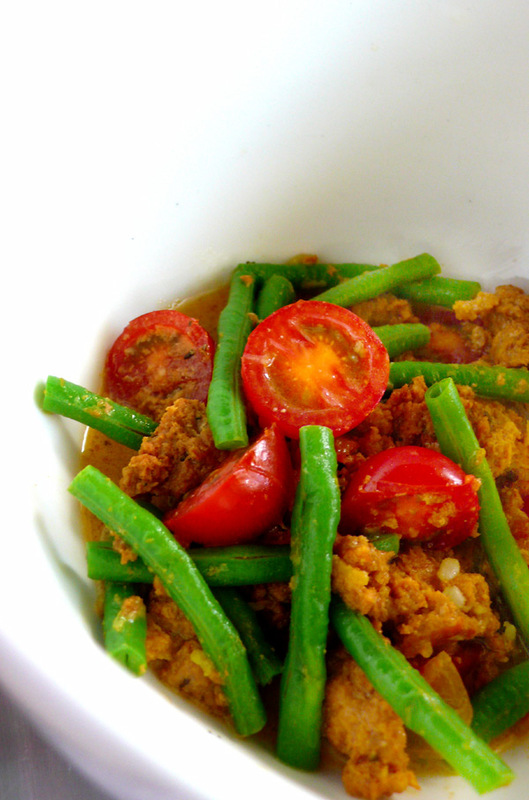 lower heat, add the coconut milk, cherry tomatoes, and pre-cooked long beans (see above), simmer until heated through. season to taste with salt, pepper, and a squeeze of lemon juice. serve with steamed rice and finadene. the backyard kitchen at sam choy's. sam choy's on guam has added a lunch menu of local cuisine. the menu is called sam choy's backyard kitchen chamoru--a rather romantic allusion to the outdoor cooking spaces that many people on the island have that are colloquially (and affectionately) known as "dirty kitchens"--and features chef peter dueñas's take on some of the local favourites. although there is a version of kelaguen, which many non-locals know, there are other items on the menu that aren't as familiar, but just as tasty. 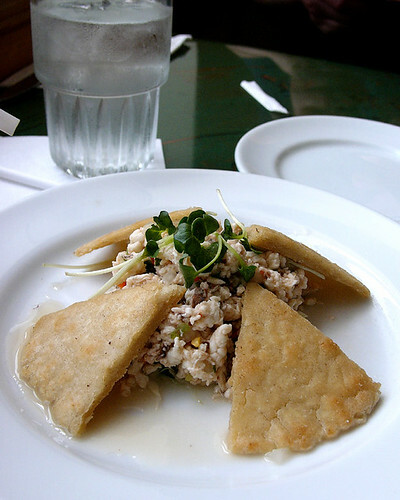 the photo above is of kelaguen uhang yan titiyas (shrimp kelaguen with corn tortillas), a sort of ceviche made with minced tiger prawns marinated in lemon juice, hot peppers, and onion, served with grilled flatbread made with masa harina and water. the prawns were tender and fresh, and the other flavours a lively counterpoint sweet meat, and tempered nicely by the subtle tortillas. 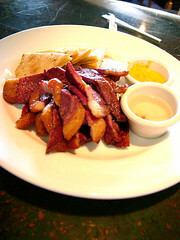 also on the menu: tinala katne, thick slices of beef brisket, salt-cured, air-dried then deep-fried. the result is something like a more tender version of beef jerky, only considerably more palatable than that. 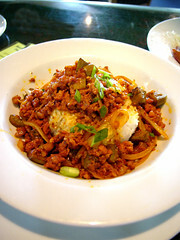 there is home-made spicy chorizo sausage, sauteed with diced eggplant, onion, and garlic, served on a bed of steamed rice. although this is somewhat oily, it has a bold spiciness that doesn't mask the strong pork flavour. 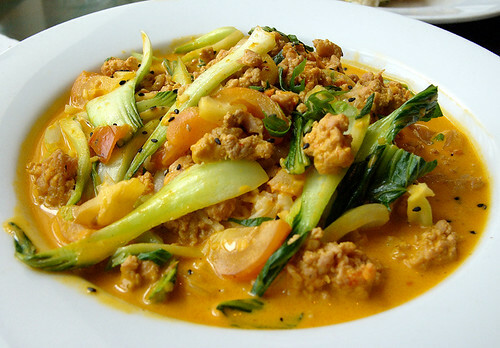 tinaktak is a dish normally made with ground beef, coconut milk, tomatoes and long beans, but in dueñas's version, he uses ground chicken and bok choy, then colours the coconut broth with achote (achiote, annatto). it doesn't add any flavour to the dish, but it is quite attractive. tinaktak is one of my favourite dishes, as i love the flavour of the vegetables cooked in the meaty, coconutty broth. the tomatoes add a little tang to the sweetish, rich dish, and the chicken adds flavour to the broth, without the greasiness and weighed-down feeling that can accompany the dish when made beef. 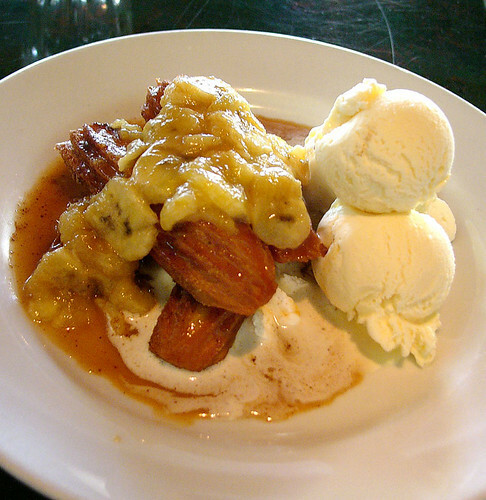 i had to throw in a dessert because usually that is the best part of a meal at sam choy's: deep-fried churros (doughnuts), served with sauteed bananas, vanilla ice cream, and a warm caramel sauce. the churro were perfectly crispy and light, and the caramel sauce quite light in both consistency and flavour. a fine accompaniment to the warm bananas and cool ice cream. although it's not a traditional recipe, it is island-y enough to be a great way to end an island-y meal. i am glad that sam choy's has added more local cuisine to the menu; frankly, i was more than a little bored with the every day menu. also, hopefully non-locals will be daring enough to try something on the backyard kitchen menu and discover how good chamoru food can be. so, this year's h'ween attendance was middling, but it's not like these were ever in the candy cauldron anyway: a plethora of kitkats for your perusal. 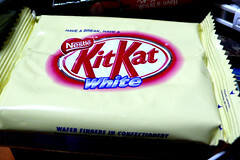 from indonesia: white kitkat, and cappuccino flavour. both quite rightly avoid the word "chocolate" on the packaging. about one-third smaller than the american sized bars, and both with an almost grainy, malted aftertaste, much like milo. what is milo, anyway? a malted grain drink? there you go. sort of plasticky, but not unpleasant. 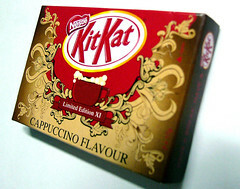 candyblog has a better review of the cappuccino one. 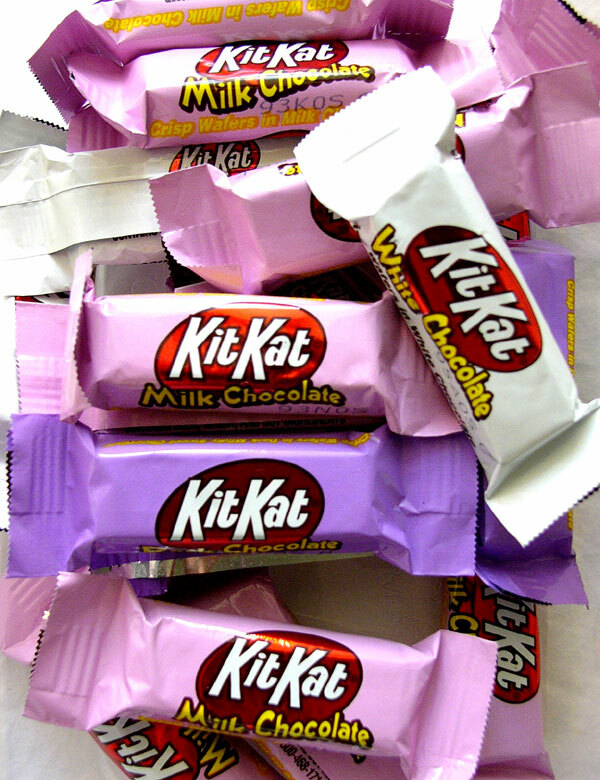 from the united states: kitkat minis, in milk, white, and dark chocolates. i rather like these individual two-bite bars. the chocolate coating used in american kitkats has always bothered me--it's too sweet to the point of harshness--but the dark chocolate's earthiness seems to compensate for that. the dark ones are always the first to go. the white ones taste, um, white. milky, sweet, like condensed milk. the milk chocolate ones are basically mini versions of the traditional american bar, the one i've come to dislike, but somehow in mini-form, they seem benign. maybe it's because they are in pink wrappers. 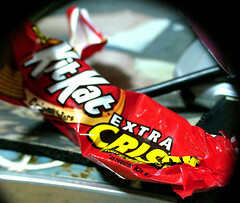 the kitkat extra crispy is one of those large single bars, and isn't so much extra crispy as super crunchy. when i think of crispy, i think of light and somewhat wispy, but biting through one of these is like inviting a marching band into your head-- CRONKBOOMSHAKALAKACRONK. errrr. the ratio of chocolate to wafer is different, with far more wafer, which actually works in favour of the bar. however, you could make yourself deaf. teresa so kindly sent me a milkshake bar, which i actually liked quite a lot--it was like eating the cookie/biscuit equivalent of a malt ball, only less sweet and more malty. so far the only american bar that i really like. 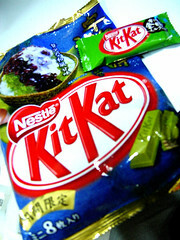 mon kitkat aussie: the chocolate used in the australian bars is better than the american bars, imo, much smoother, creamier, and less cloyingly sweet. 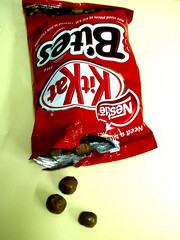 the kitkat bites, which were like biscuitty pellets with chocolate coating were very good, just enough per bite for it to actually taste like chocolate, just enough crunch. 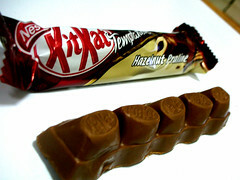 there is a line of kitkats called temptations, and in this particular version of that, there are humps, my humps, lovely non-lady humps of filling like hazelnut praline, coconut, and caramel fudge. i think in theory it's a genius move, but in practice, it's just sort of okay. like eating a two candy bars at once, only one of the bars is way better than the other and dragging the good one down. she who eats is she who sent these lovely japanese bars to me: strawberry, white chocolate/maple syrup, and wine, from patîssier takagi. 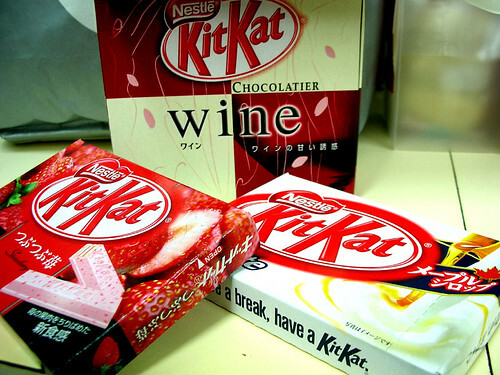 there's a particular fake strawberry flavour i associate with japanese candies, and this strawberry bar has it. it's not unpleasant, but it tastes less like berry than it does like pink. this bar tastes pink. the wine bar is almost indistinguishable from the strawberry bar, the only difference is that it has a very subtly grapey aftertaste. 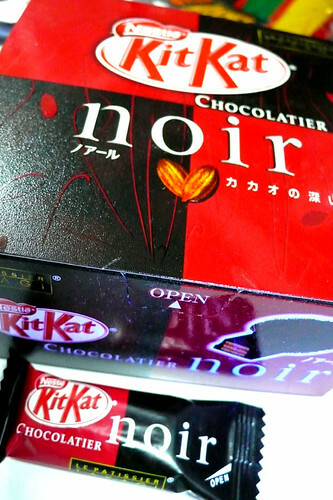 however, as one of the limited edition patîssier takagi 'kats, the couverture coating is a higher grade than the typical japanese kitkat, which can easily be described as either plasticky, greasy, or if you like it (like i generally do), extra creamy. 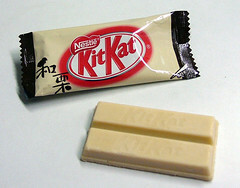 the white bar has a very pleasant lingering maple note that doesn't add too much extra sweetness to the white chocolate. i just want to let you know, i didn't try all of these at once, they were sampled throughout the year....also, how long does it normally take you to write a post? because this one is taking ages. where was i? ah, chestnut. was chestnutty. very sweet. green tea maccha. i defer to candyblog. 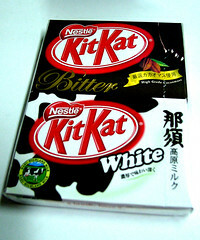 bitter (dark chocolate), and white (milk). havena tried them yet, will get back to you. uji-kintoki, not green tea, but with green tea as a component, along with red bean, condensed milk, and presumably not shaved ice. well, at least i didn't taste it. verrrry subtle, more beany that tea-ey. very sweet. 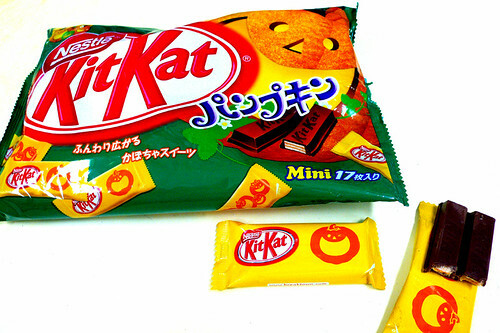 and oh, yes, the pumpkin kitkat (photo at top of post). hm. how do i put this? at once completely repellent, and compelling at the same time. NOT to be mistaken for pumpkin pie flavour, the smell of pumpkin assails you the minute you rip open the wrapper. the flavour tastes like real pumpkin, not artificial, but is so strong and so unspiced, it's like eating raw pumpkin covered in chocolate. only not as pleasant. it reminds me of kabocha squash tenpura. wrapped in greasy chocolate. mmmmmmMMMM. and the lingering squashy taste only makes me crave it more. gaaaaaah. and finally, another patîssier takagi creation, noir: tiny half-sized fingers wrapped in a quality dark chocolate and dusted with unsweetened cocoa. dirty and decadent. I knew the wrapper would come off and I was mad for trying but something about that chocolate just said yes. When I came around Benny the Fink's goons were making with my jaw like it was their step-kid. ...and there she was, that beautiful dame with the gams that went up to her elbows, laughing like a drain. at me, and my kisser filled with blood, and 71% dark cacao. it was revenge for tooting the wrong ringer, as bittersweet as the dusty layer of cocoa, smeared on my rearranged map, courtesy of benny's trouble boys. feel free to continue the flickr fiction in the comments. or not. 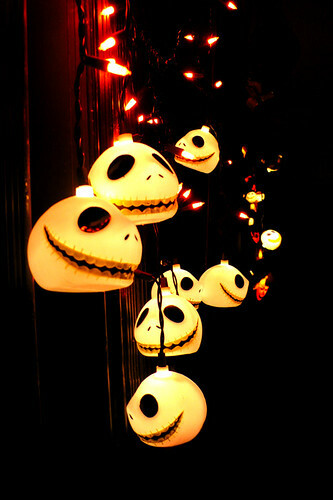 ah, halloween. this year was a little slow for us, only about 1500 kids showed up compared to last year's estimated 2500; perhaps because it was a school night. despite the "low" attendance, we still had to hire several neighbourhood kids to come and direct the flow of traffic and hand out the sweeties. and what did we feed these constantly hungry teenagers? 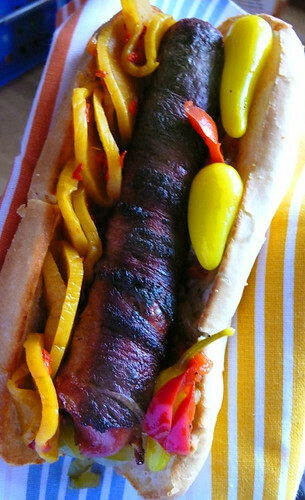 charcoal-grilled bacon-wrapped hot dogs with grilled onions, sweet peppers, chili peppers, and korean spicy pickled radish (daigo). doin' streetfood guamish-style, and making all the kids happy this year.